Off the shoulders by Bella. We see beautiful Bella Hadid wearing an off-shoulder black ruched top tucked in wrap cherry red leather pants. An ideal Summer combination for those who want to impress people on the streets. Leather pants are something versatile that can be dressed up or down. These bottoms work with completely anything. I tell you honestly, I never get enough from leather pants. In this awesome street style collection are gathered super fabulous combinations you can rock in your everyday life, as well as during special occasions. I personally keep my look sporty rock chic, but you can start with smart-casual combos. Glossy black leather pants in skinny fit look awesome with a rich blue cable-knit sweater. Complete this outfit with a pair of dark blue pumps. Trust me, leather pants will make you look hot and cool, just make sure you wear these bottoms in right way with appropriate items. You are free to create amazing outfit ideas, which can look glam, chic and trendy. Just don’t make them look cheap on you, as you can end up looking ridiculous. In this post are gathered amazing outfit ideas for those women who really want to show off their individuality. We have already seen double denim outfit ideas, now it’s time to see awesome ways how to style double leather looks. In today’s blog post I decided to share with you simple ideas that are easy to wear and combine with everyday basics. You are going to see leather jackets paired with pants, as well as with shorts and skirts. I personally like to see women in skirts, it makes them look less edgy. Anyway, there are lots of awesome ways how to pull off this tricky trend. You can either create a modern tough girl outfit or look more sophisticated. So, how should you wear this look? Have a look through these ideas below and choose your favorites. This might be one of the best Fall season looks. 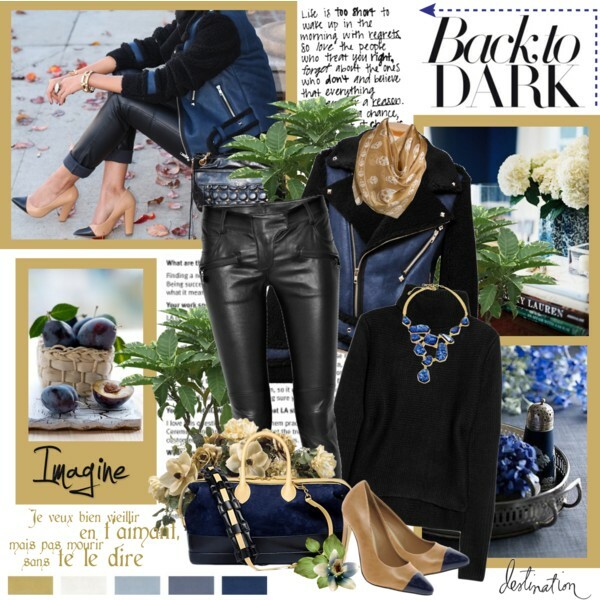 It consists of black leather pants teamed with an aviator jacket in blue with black sleeves. Add a black sweater and beige pumps with blue pointed-toes.